We take the 24-bit OUI portion, the left-most 24 bits of the Ethernet address, and put them into the left-most 24 bits of the interface ID. We take the 24-bit local portion (the right-most 24 bits of the Ethernet address) and put it into the right-most 24 bits of the interface ID. In the remaining 16 bits in the middle of the interface ID we put the value 11111111 11111110 (FFFE in hexadecimal). The address is now in EUI-64 form. We change the universal/local bit (bit 7 from the left) from a zero to a one. This gives us the modified EUI-64 interface ID. Key Concept: The last 64 bits of IPv6 unicast addresses are used for interface identifiers, which are created in a special format called modified EUI-64. 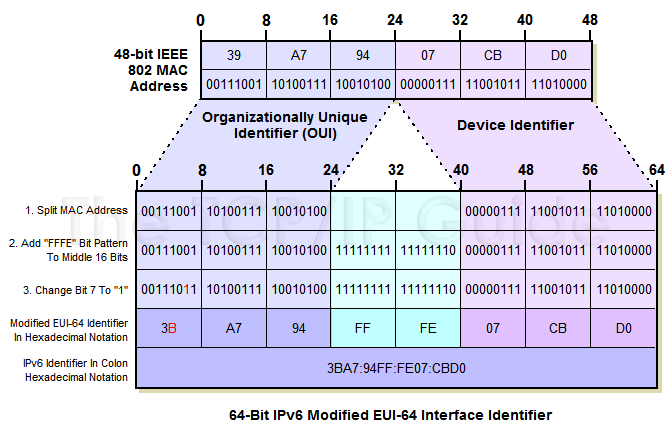 A simple process can be used to determine the interface identifier from the 48-bit MAC address of a device like an Ethernet network interface card. This can then be combined with a network prefix (routing prefix and subnet ID) to determine a corresponding IPv6 address for the device. We take 39-A7-94, the first 24 bits of the identifier, and put it into the first (leftmost) 24 bits of the address. The local portion of 07-CB-D0 becomes the last 24 bits of the identifier. The middle 16 bits are given the value FF-FE. We change the seventh bit from zero to one, which changes the first octet from 39 to 3B. The identifier thus becomes 3B-A7-94-FF-FE-07-CB-D0, or in IPv6 colon hexadecimal notation, 3BA7:94FF:FE07:CBD0. The first 64 bits of the device's address are supplied using the global unicast address format. The only drawback of this technique is that if the physical hardware changes, so does the IPv6 address.